Researchers from the National Consortium for the Study of Terrorism and Responses to Terrorism (START) recently released a dataset that provides detailed information on organizations known to have engaged in terrorist activity against targets on United States soil between 1970 and 2010. Built by a small team of START research assistants directed by Global Terrorism Database (GTD) Manager Erin Miller and START investigator Kathleen Smarick, the dataset, Profiles of Perpetrators of Terrorism in the United States (PPT-US), allows researchers and analysts to closely examine the characteristics of terrorist groups that have carried out attacks in the United States by providing them with descriptive narratives on the history and philosophy of each organization, as well as information on variables such as ideology, structure and involvement in activities other than terrorism. As part of the Integrated U.S. Security Database (IUSSD) project, PPT-US provides researchers and analysts with group-level contextual information that complements data on terrorist activity and individual perpetrators from sources such as the American Terrorism Study, the GTD and the Extremist Crime Database. According to Miller, preliminary findings from the PPT-US database indicate that there is no "profile" of organizations that target the U.S. homeland with terrorism. Rather, the groups that have attacked in the United States since 1970 have widely varied ideologies, beliefs and goals. Between 1970 and 2010, 32 percent of the perpetrator groups were motivated by ethnonationalist/separatist agendas, 28 percent were motivated by single issues, such as animal rights and opposition to war, and six percent were motivated by religion. In addition, 11 percent of the perpetrator groups were classified as extreme right-wing, and 23 percent were categorized as extreme left-wing. 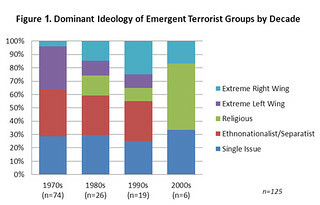 Preliminary findings from PPT-US data also illustrate a distinct shift in the dominant ideologies of these terrorist groups over time (see Figure 1), with the proportion of emerging ethnonationalist/separatist terrorist groups declining and the proportion of emerging religious terrorist groups increasing. However, while terrorist groups with religious ideologies represent half of all emergent groups in the 2000s (three out of six), they only account for six percent of groups over time. In the next phase of their PPT-US research, Miller and Smarick plan to examine relationships among many of the characteristics identified in the dataset, including whether there is a correlation between specific goals of a group and that group's duration, or between a group's ideology, its other political activities and the nature of the terrorist attacks it perpetrated. By providing the first structured, comparable dataset on groups that have engaged in terrorism against the U.S. homeland, the PPT-US helps advance the science of terrorism and serves as an invaluable resource for counterterrorism researchers and analysts. This research is supported by the DHS Science and Technology Directorate's Human Factors/Behavioral Sciences Division.